It’s spring and that means lots of time outdoors. Are you making the most of your time afield? 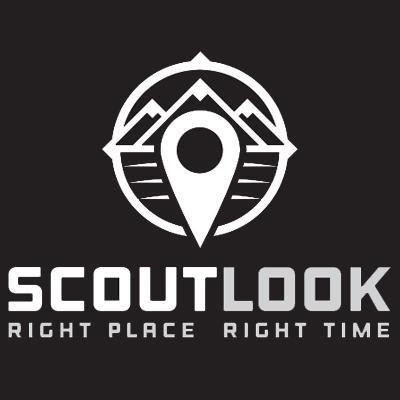 Whether you’re searching for shed antlers, scouting post-season whitetail sign or in pursuit of spring gobblers the powerful and easy-to-use tools of ScoutLook can greatly contribute to hunting success, while going well beyond predicting just weather and wind. Remember, the ScoutLook Hunting app has the following modes: Deer, Turkey, Waterfowl, Predator, Hog, Big Game. Be sure to select the correct mode for the type of game you’re hunting. When the ScoutLook Hunting app is set to Turkey Mode, you’ll notice “GobbleSpot” is available in the dropdown menu when you tap the “Save” button. 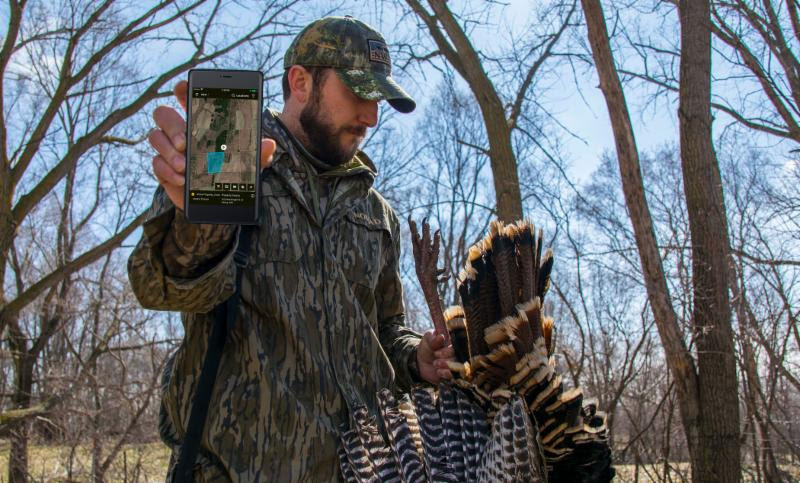 When you hear turkeys gobbling, open the app and drop a GobbleSpot pin on the location where you think they’re gobbling. 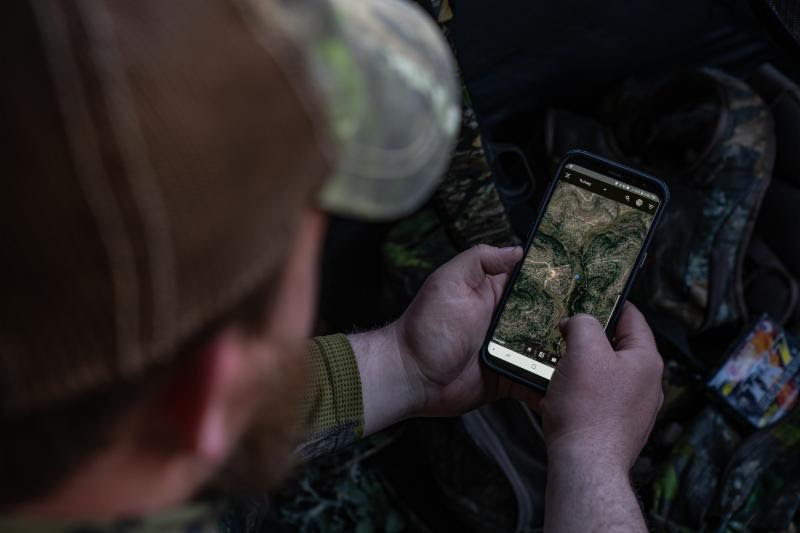 This will make it easier to navigate to a gobbler and set up, and it will also help you keep track of all the spots you’ve heard gobblers to consider on future hunts. You spotted a gobbler on an unfamiliar property. Do you have access to hunt here? Check ScoutLook’s Property Lines to look up landowner information. If you don’t have permission, use the landowner’s mailing address to find their home and knock on their door. By logging turkey observations, over time you can begin to recognize activity patterns that will lead you to more successful hunt planning. ScoutLook allows you to save turkey logs according to subspecies, turkey seen, log time, activity, and additional logging fields if you harvest a bird. Analyze your logs in the app, or open your account on the ScoutLook website to sort logs according to various conditions. It’s windy. Is it more important for you to hear gobbles from upwind or for your calls to project greater distances downwind? By using ScoutLook’s ScentCone wind map in Turkey Mode, you can decide how to approach a field or block of timber depending on your listening or calling strategy. 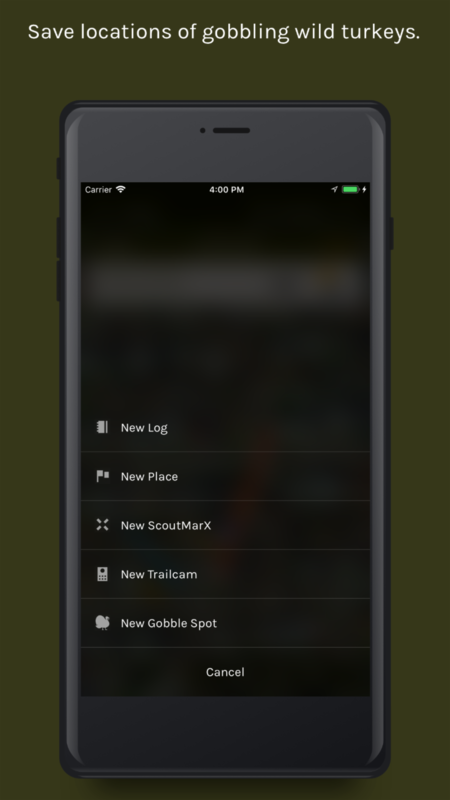 ScoutTreX provides real-time tracking of your movements in the ScoutLook Hunting app. 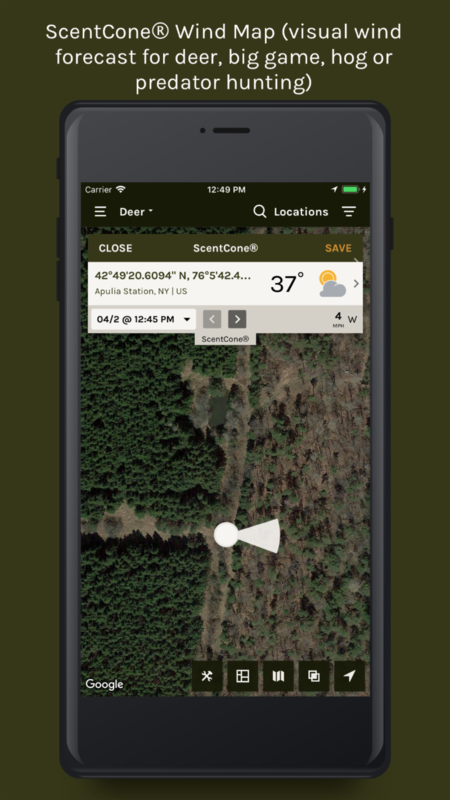 As you chase gobblers all over the woods-especially on new, unfamiliar properties-it can be helpful to keep track of your movements with ScoutTreX so it’s easier to get back to your camp or vehicle. As you’re digitally scouting a property with ScoutLook’s interactive map, you might want to determine the best place for a morning or afternoon blind setup. If I hunt on this field edge, how far will I be able to shoot? Use ScoutLook’s Distance Measurement tool to make sure you’re setting up in a spot that will allow you to cover as much ground as possible in your effective range (gun or bow). How big is that block of timber on this new hunting property? Use ScoutLook’s Area Measurement tool to determine acreages. Use MapMarX to create freehand drawings our boundaries in the ScoutLook Hunting app. Example: Maybe there’s a particular ridge on a large property where gobblers seem to consistently hang out. Draw a line around the ridge using MapMarX and create a note. You can also share MapMarX with fellow ScoutLook users; when you share, the MapMarX will automatically show up in their app. Apply your knowledge of turkey activity related to terrain features by viewing ScoutLook’s interactive map with the Terrain layer turned on. How might you approach a roost on a steep ridge? What’s the most efficient way to get back to camp without ending up on a death march? The Terrain layer will help. Precipitation can greatly determine the fate of a turkey hunt. Keep track of rain showers and storm fronts as you’re planning your hunts by using ScoutLook’s Radar map overlay. 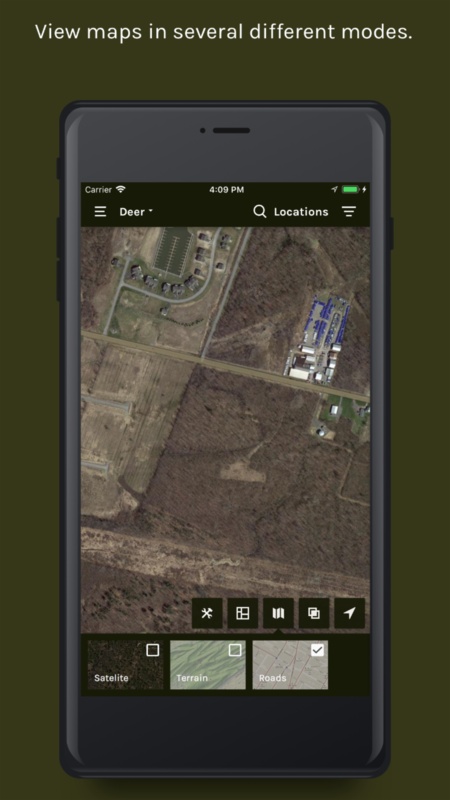 Want to share information to collaborate with your hunting buddies/fellow ScoutLook Hunting app users? It’s easy with the sharing feature in the app. Go to your list of Saved Locations from the main menu -> tap on one of the Places, ScoutTreX or MapMarX that you want to share -> tap the plus-sign icon -> tap the share icon -> tap the check box next to the name of your friend with whom you wish to share -> tap the “share” button. Now your friend will be able to access the shared info in their app. 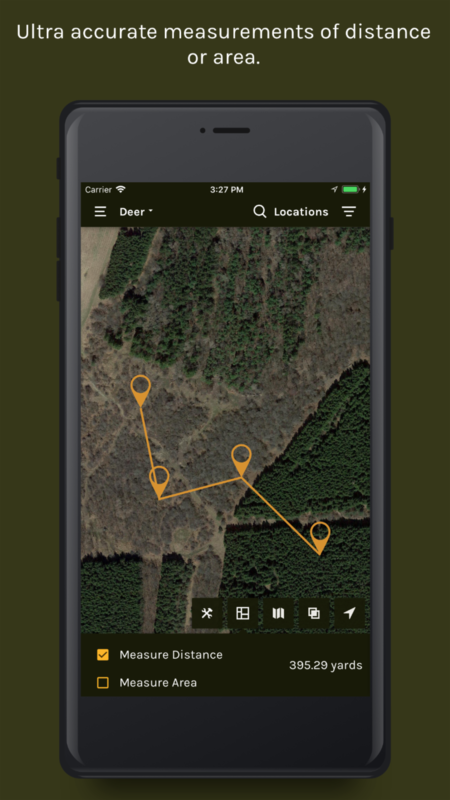 Still not using the most power app for a successful hunt? Download ScoutLook Hunting at no charge from Apple’s App Store or Google Play today. For FREE use of the Property Lines feature, contact tkent@phenixbranding.com with your user information and we will set up complimentary access for use of this critical feature. More information can also be found at www.scoutlookweather.com or on YouTube.